I was strolling with my son through the Metroparks today, enjoying the Spring weather, and green bushes, and noticed a familiar creeping vine along the path. My son is at that age where he picks up every single stick and stone along the path, and as he reached for the shiny, reddish leaves, I lept after him. And I thought - "I wonder how many people know that poison ivy is red in the Spring"? So that leads us to our first tip. 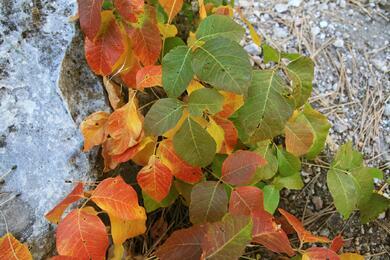 PLANT FORM - Most of us know that old adage - "leaves of three, let it be" but poison ivy can take many forms. It can creep along the ground in vines, grow as a small shrub, or climb up trees, fences and landscape walls. Its leaves can be lobed, smooth, toothed or have hairy undersides. COLOR - In the Spring, poison ivy will have small, reddish, shiny leaves. In Summer, its leaves will turn green and can be shiny or dull. And in the Fall, poison ivy leaves and vines will take on the vibrant colors of Autumn, in shades of orange, yellow and red. It is also important to note that the oil, Urushiol, on the poison ivy plant is present in the same amount and strength at all times of the year. So even if the plant is dried out in the fall, touching its leaves, vines, stems or roots can cause a skin reaction. Also, while direct contact with the poison ivy plant is the usual way of contracting a rash, it is not the only way. Pets, tools, and clothing can spread the plant's oil to humans, as can burning the plants and breathing in the smoke. And where poison ivy has grown up next to a body of water, the oil can spread across the surface of the water, and contact with the water can also cause a poison ivy rash. Controling poison ivy can be difficult. To be effective, you must dispose of the entire plant. Its vines must be cut and pulled away from trees, fences or walls. Its roots must be dug up. Mowing or cutting young shoots regularly until the plant dies can be effective. But you must not burn the poison ivy, and should take care to dispose of it where it cannot contaminate people or animals. When taking on this unpleasant task, you should cover as much skin as possible with protective gloves and clothing. Clothing and tools should be cleaned to prevent the spread of urushiol. And you should wash up immediately after you're through to prevent any oil that has come in contact with your skin from causing a rash. There are weed killers that can be used with good effect, like Roundup and others found at home improvement stores, specifically formated to target poison ivy. Another fun option for poison ivy control - discussed by Penn State University's Home and Garden Extension program - Goats! In their article "It's Poison Ivy Time", goats are presented as an incredibly effective and eco-friendly, though somewhat impractical, solution to controlling poison ivy. Goats graze in places that mowers can't reach and where humans don't want to go and they LOVE poison ivy, along with many other types of unwanted vegetation. And believe it or not, there are several farms in the Northeastern Ohio area , like As You Wish Acres, that provide a "Haulin Goats" program that allows you to rent their goats for the day. They will set up a temporary fence around the area you want cleared, set the goats to work, and pick them up in the evening after they've eaten all your dirty work! Want to hire professionals, not goats, to handle your lawn and landscape? Click below to get an easy, no pressure quote for a lawn care program from the experts at Weed Pro.